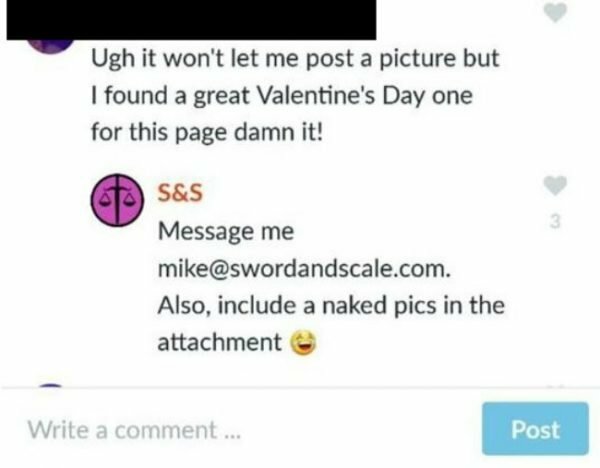 The list of accusations directed at Mike Boudet, host of Sword and Scale. COVER STORY: After some revolting comments, people are boycotting one of the most popular podcasts. 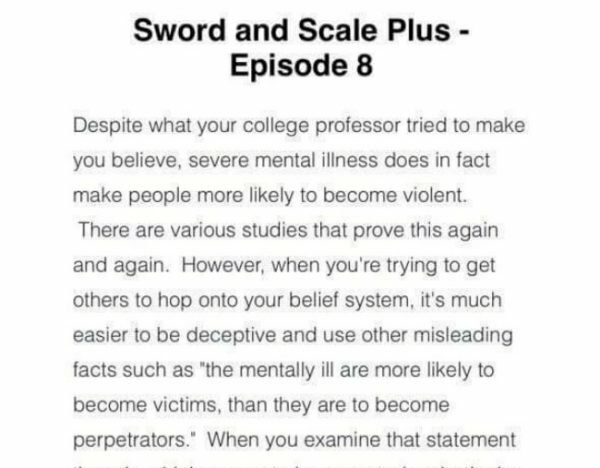 Sword and Scale (S&S) is a true crime success story. The bi-weekly podcast, hosted by Mike Boudet, had over a million downloads in its first year and regularly ranked at the top of the iTunes charts. In a post-Serial true crime podcast obsessed society, S&S provided everything we needed – it appeared to be a well researched, well produced program which took an in depth look at both famous and lesser known crimes. The podcast is still going strong. The S&S Facebook page has almost 100,000 likes, there are over 12,000 people supporting it on Patreon, and it sits in the top 60 of all podcasts on iTunes with over 861 reviews, giving it a rating of above 4.5 stars. If you were just a listener of the show and had no other interaction with the podcast community, you could easily have skipped the drama that has haunted S&S, and host Boudet. However, what started as whispers across social media has finally blown up with a single Twitter exchange earlier this week, bringing all those concerns flooding to the surface, and the boycott of S&S has begun. The Boudet drama first kicked off when reports surfaced of predatory, and downright creepy, comments towards female fans. Boudet moved from inappropriate advances to straight up requesting nudes and back again – swiftly blocking anyone who raised concerns about his behaviour. This was during a time when he was still in the My Favourite Murder Facebook group. One of the only podcasts to rival S&S in speedy popularity and fame, MFM is hosted by comedians Karen Kilgariff and Georgia Hardstark and boasts a die hard group of fans known as murderinos. Mike Boudet speaking to female fan. Image supplied. Mike Boudet responds to female fan. Image supplied. Somewhere in the middle of his comments to female fans, Boudet began to turn on the MFM community. This could have been a potentially career ending move, the only thing murderinos like more than MFM is inclusion and positive outlooks. But somehow Boudet made it through his MFM attack unscathed. 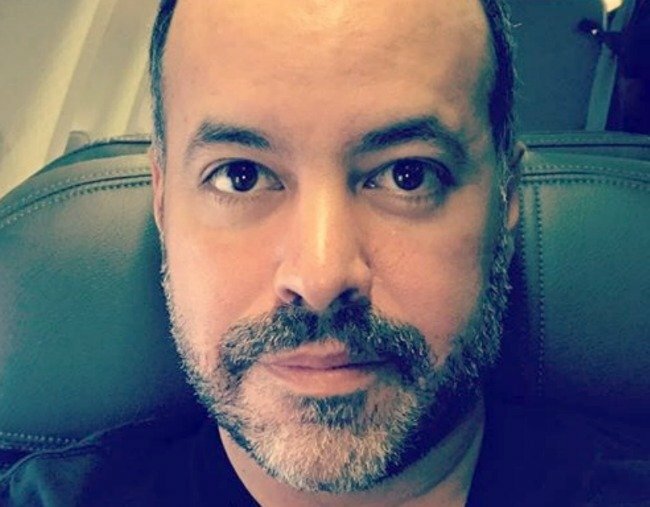 During this time he made comments that members of the MFM group and the true crime community at large had been harassing him online, something he has maintained throughout most of his career. S&S has also faced backlash over the years for the use of 911 calls and Boudet&apos;s handling of sensitive topics such as mental illness. While other true crime podcasts have also used 911 call audio in their production (Last Podcast On The Left and Generation Why to name two large examples), S&S has been accused of using the audio gratuitously – opting to include entire phone calls without any censorship, including those involving victims and children. One episode in particular dealt with a 14-year old who had called 911 when his father killed his mother. 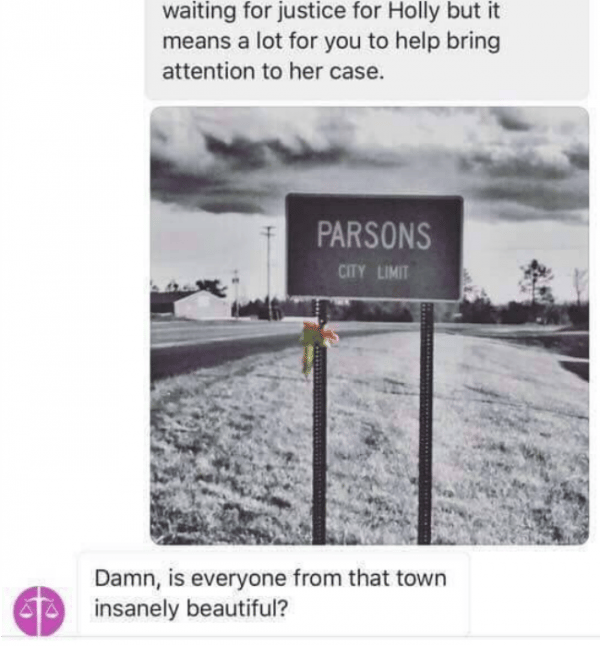 The entire call was used on the show, with no approval given from the family, and when someone claiming to be the boy called Boudet out on the S&S Facebook page, Boudet called him a &apos;troll&apos;. Mamamia has seen the screenshots in question. Boudet also allegedly sent aggressive tweets to other family members who contacted him about the incident. Listen: The year that was true crime. Post continues below. Despite this list of concerns and complaints, it took one exchange with a fan this week to push S&S into boycott territory. S&S listener Julieanna Pinto sent Boudet a tweet asking him to cover her death on the podcast if anything ever happened to her. Boudet responded with &apos;And she died of mild heart disease and a high-cholesterol diet&apos; – a comment seemingly aimed at Julieanna&apos;s appearance. The tweet from Mike Boudet. Image supplied. The response was swift and brutal. Speaking to Mamamia, Julieanna said she wasn&apos;t prepared for how much support she would receive. “I was mostly overwhelmed with the response from other people and their support,” said Julieanna. “I didn&apos;t know about the rest of the issues that followed him. I tweeted him as a fan and a longtime listener and seeing his response was disappointing. Luckily for me I didn&apos;t see his response until later in the day and by that time a lot of people had already sent me supportive tweets,” she said. Julieanna was swiftly banned by S&S on Twitter, but not before Boudet threw in a comment seemingly aimed at MFM host Georgia Hardstark. Neither Boudet nor Wondery, the network that hosts S&S, have been quiet throughout the years of backlash. 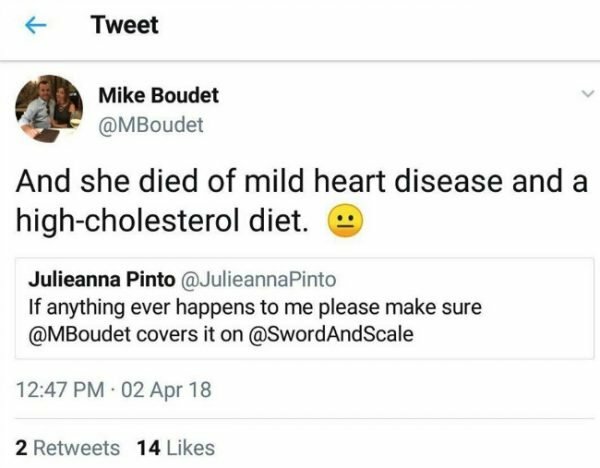 On top of Boudet&apos;s swift Twitter responses to any criticism, he has also apologised for the tweet to Julieanna, basically saying he was misunderstood and was trying to suggest that most people die in fairly boring ways. Mamamia reached out to Mike Boudet for comment. He responded: "In regards to the woman who felt offended by my comment online I very much regret my dumb joke. I apologized and took myself off of social media indefinitely. However, my apology should still be up on my social media accounts." Julieanna said Wondery reached out to her and apologised for Boudet&apos;s tweet, and she did think the apology was sincere, however other fans have criticised the network for its support of Boudet. 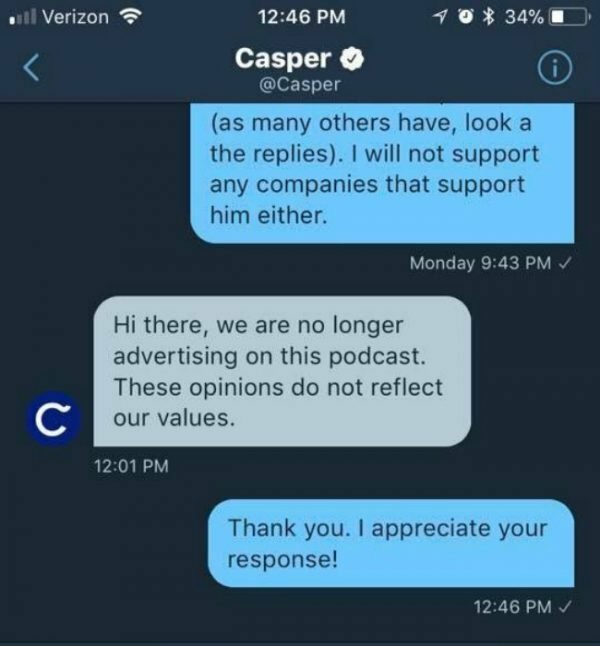 The boycott has also extended to advertisers, with mattress manufacturer and podcast advertisement favourites Casper saying they have already dropped all advertising with S&S. Casper mattresses has withdrawn sponsorship. Image supplied. As one user on Reddit has raised, while the allegations against Boudet are numerous, you don&apos;t have to believe them all to think something must be going on. Even if you only narrow it down to the allegations which can be verified with confirmed screenshots, there is enough information to suggest that at the very least Boudet&apos;s dealings with fans are at best bad PR and at worst malicious and predatory. But with thousands of fans still willing to fly the S&S flag, it seems unlikely that this latest indiscretion will be the end for Boudet.